Rory McIlroy gave a clear insight into the vast amount of work he has put in on "mind training" this year as he heads into his 11th Masters full of confidence. McIlroy's more relaxed mindset and calm demeanour has been a feature of his outstanding start to the year, and the work he has put in off the course on the mental side of his approach was validated when he stormed to victory at The Players Championship last month. His huge win at TPC Sawgrass followed five straight top-six finishes, and he admitted that he has been focused on separating the need to win from just wanting to win and not putting added pressure on himself to get results. McIlroy's superb form ensured he arrived at Augusta National as the world No 3, his highest ranking since the 2017 US Open, and he is determined to stick steadfastly to his new formula as he bids to atone for his previous disappointments at the Masters. "You always feel like you're on the right path and whatever you're working on is the way forward," he said at his pre-tournament press conference. "But to get that validation, the win at The Players, the close calls, the good play that I've had over the first four months of the year, it just proves to me that what I'm doing are the right things for me. "I've found a formula that works for me, and I'm going to persist with it and I'm going to stick to it. It's helped me play some of the best golf of my career so far this year, and hopefully that will continue. "It's been a wonderful start to the season, and my consistency levels have been as good as they ever have been. I don't think I've ever started a season this well in terms of finishes, and looking at all my stats, they are right up there with some of the best years that I've had. "I've been focusing on the small things and not living and dying by results, and not getting caught up in trying to play perfect golf. Maybe a little more acceptance, and a little bit of change in attitude, which I think has been one of the biggest keys to how I've played for the first few months of the year." 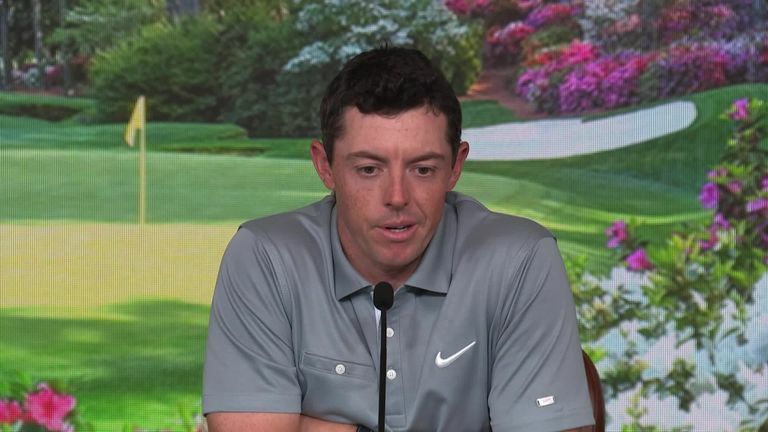 McIlroy has previously spoken of the "mental hurdle" he needed to overcome to win that elusive Green Jacket and complete a Grand Slam of major victories, but he denied his changes in mindset were long term and not geared specifically towards helping him cross the line at the Masters. "No, that's definitely not a good place to be in," he added. "It's to make the most of the next 20 years of my career. It's not just about one week. This is a lifelong journey of trying to improve and learn and try to master my craft, which is golf. That's what I've chosen as what I want to do, and with my life. That's a lifelong pursuit, and it's not just one week a year. "Look, you still want to win, but there are ways to do it and there's mechanisms that you can put in place that help you achieve your goals that aren't just about the result. It's about the process of getting to that point. "So it's not as if I'm coming here not to try and win the golf tournament, but I know if I have the right attitude and I have my goals that I want to achieve this year, the by‑product could be winning this golf tournament. "I think I've had a healthy dose of perspective this year, and that's helped, either with great results like The Players, or undesirable results of not being able to finish a tournament off. So being able to put both of those things in perspective have been a good thing." McIlroy also insisted he feels far more comfortable with the "creative" challenges presented by Augusta, although it took him many years to learn, and he has played enough good golf at the Masters to give him positives to draw on this week. "I think it takes a while for to you get comfortable on this golf course and the surroundings," he said. "But I have got that comfort level now and it took maybe five or six years to get to that point. "And I know I've played well enough and I've shot enough good scores around here over the years that, if I can put my best effort forward, I'm going to have a good chance to do well here. "But my mindset is a little different now. I'm still practising, I'm still getting better, but I'm not getting ahead of myself and not thinking about the tee shot on Thursday or what is to come this week. That is something I probably will never stop trying to learn or to practice, but I'm in a good place with it. "I keep saying this, but I would dearly love to win this tournament one day. If it doesn't happen this week, that's totally fine, I'll come back next year and have another crack at it. But I'm happy with where everything is; body, mind and game."